Charlie Christian was an American jazz guitar player. He was one of the first to amplify his guitar and became a pioneer of electric guitar playing. His style consist in playing play notes separately rather than chords. He invents the guitar solo, which combined with electric guitar, will do its reputation of guitar genius. In 1939 Benny Goodman hired him in his sextet. Then, he went on to play with the greatest jazz players (Lionel Hampton, Cootie Williams, Benny Carter, Count Basie, Charlie Parker, Dizzie Gillespie, Thelonious Monk, Kenny Clarke, etc.) while still recording with the Benny Goodman sextet. Here are some masterpieces to listen : Breakfast feud, air mail special, Blues in B, Solo flight. 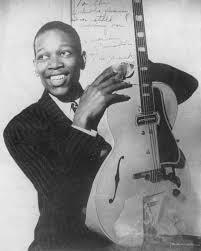 Charlie Christian used to play a Gibson ES150. The guitarist 's career ended prematurely at the end of 1941 , when he was hospitalized for tuberculosis. He died a few months later, on March 2, 1942. This is a Charlie Christian jazz guitar solo transcription with tabs from the tune Benny's buggle". This jazz guitar lesson is about a Charlie Christian jazz guitar solo transcription with tabs from the jazz swing tune "Swing to bop". This is a Charlie Christian jazz guitar solo transcription with tabs from the tune swing to bop.